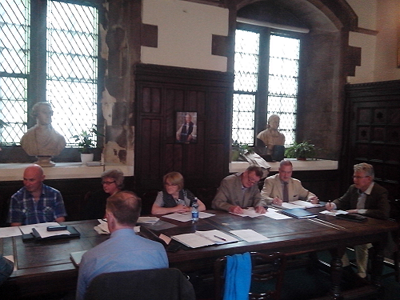 On the last Saturday of June, a balmy Summer day, the Clans of Ireland Board met at the Chapter House of Christchurch Cathedral in Dublin; in a wonderfully ancient panelled room with the most amazing historical portraits on its walls. The history of Christchurch goes back to Viking times and Clans of Ireland is honoured to be given this facility as a venue for its regular board meetings. Your board meets several times during the year. Members travel from as far away as Waterford, Cork, Kerry, Galway, Fermanagh and even France. They do this at their ownexpense as their roles are purely voluntary. The year ahead will involve continuing with some existing projects, developing some new projects and crucially tackling some organisational governance issues, while also implementing the new Irish Companies Act. The Companies Act 2014, which came in to effect on 1st June 2015, has been described as the most comprehensive reform of company law for generations. The Act effects all companies in Ireland especially private limited companies and the Board has an obligation to examine options in relation to corporate governance, codification of duties of directors, retirement of directors, Annual Returns and other compliance issues.